Essential oils have a way of gripping our minds and drawing us into the world of aromatherapy, don't they? It seems like once we inhale that first breath of some nostalgic aroma that immediately calms us or transports us to a happy moment from our childhood, we want to learn all about how essential oils work and how we can use them to benefit ourselves, our families and our communities. We start studying; the 'bug' grips us and our excitement gains momentum as we deepen our understanding, build our libraries and start to navigate through all that chemistry-related jargon. Before long, we're looking at aromatherapy certification courses. Continuing education and professional associations make it onto our "to research" lists and before long, we're shoulder-deep in an aromatic ocean that doesn't seem to have an end as we look out at the horizon. Yep, they draw us in alright. Are you an aromatic enthusiast? Perhaps you're reading aromatherapy books in those rare free moments after putting your little one to bed, attending webinars while the kids are in school, and comparing your monthly budget with the cost of that course that's on your wishlist. Or maybe you're working full time and, while money isn't an issue, you have no idea when you would ever have time to make your way through the course you want to sign up for. You value formal training and investing in your education, but you're just not sure yet if it's going to be worth it for you to pursue it right now. Or maybe you just don't know what you would do if you did have a formal education in aromatherapy. You don't necessarily have the space to set up a practice and aren't sure if you want to be making and selling products. You want to learn how to use the oils safely and effectively in your own home, but don't know if you need a formal education to do so. 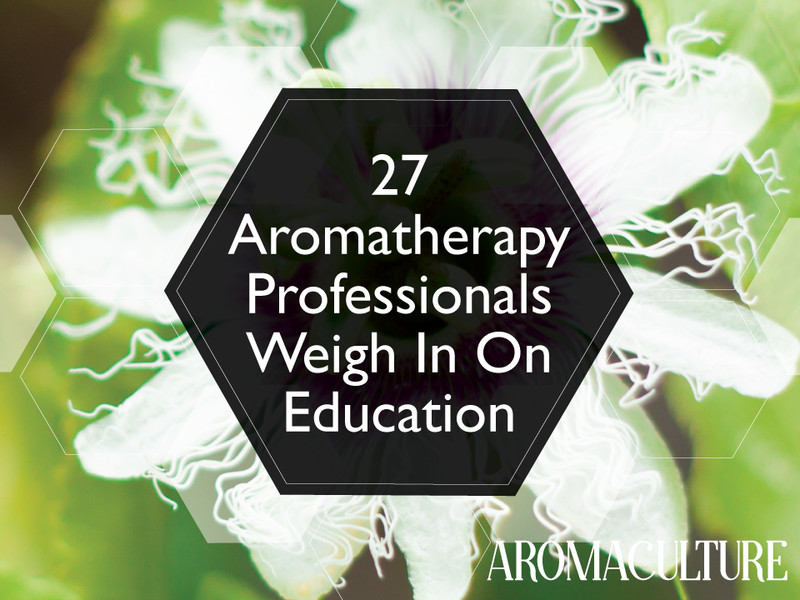 As an introduction to a new blog series, I recently spoke with 27 experts in our industry about what they think about aromatherapy education. How valuable is it really? What do you learn in formal training that you can't learn in even the best of the books or online? How are they using their training now? Ready to know how they answered these questions? I think you'll be inspired and that you'll find the common threads woven throughout their answers quite interesting! Our 27 experts are a blend of Certified and Clinical Aromatherapists (about half are also trained in aromatic medicine), industry Scientists/Chemists, Educators, Registered Nurses, Licensed Massage Therapists, Herbalists and professional holistic health practitioners. *All but one are continually investing in further education. My thanks to everyone who so generously participated in this interview!